So THAT'S where that pair of socks was. I really need to make sure I clean out the suitcase thoroughly when I get home. The last time I used the biggest suitcase was when I went to Carole and David's in November. I left the suitcase on the settee on Wednesday, after mom headed back to Iowa. I felt it would reassure the girls that I wasn't going anywhere. Plus, Pilchard lay down on the top and I don't disturb a sleeping cat. When she moved, I would retrieve my toiletries. I pulled this pair of socks out of the suitcase and didn't remember packing them. 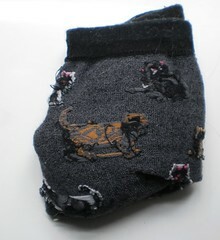 I have another pair close in color and design and they were in the sock drawer. So this pair had been in the suitcase since November. I'm glad I didn't lose them. I discovered, in looking at the wedding photos, I look like I'm scowling or angry. I'm really not, but it's rare to see me look happy. Maybe that's a reflection on the difficulties of the past almost 2 years. It's more a reflection of the fact that I don't have good teeth and smiling is something of an embarrassment. But, I don't have to look like I disapprove of everything either. I need to work on looking content. You never know who is taking your picture. I will probably always overestimate how much of something to buy. 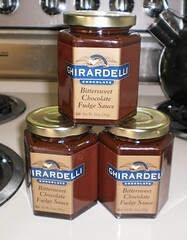 I came back with 3 jars of chocolate sauce. Carole and David have the one which was opened but only a third was used. Plus, I got 5 containers of whipping cream when 3 would have been plenty. I was going to take most of the containers when we left but I didn't realize we didn't have them until we were well away from Warrenton on Sunday. I hope Kitty and David have a use for it. I'm just never sure how much of something to buy when I'm feeding more than a family of 6. It's always been a problem. The whole "suggested serving size" is absolutely no help in figuring this out. A "suggested serving size" of fudge sauce is going to be different between me and you as well as what is the sauce going over. Plain vanilla ice cream requires more sauce than chocolate chocolate chip with bananas, walnuts and maraschino cherries. Because these are well sealed, the sauce will last longer. As June heads into July, I should order some Oberweise ice cream this coming Thursday. July 4th and ice cream with chocolate sauce. Yes, I can celebrate independence in that fashion. I wonder what happened to the extra Blue Moon ice cream. If there had been a way to take some home with me, I would have. 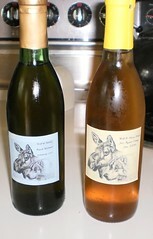 If there was a way to subsidize Perry's mead making, I would do it...in a heartbeat...no questions asked. I want to open one of these because I know how good the mead will be, but then, drinking it means I'm closer to being out of it. Dilemmas. Dilemmas. Why is it that we go some place new and say, "This reminds me of the area around Strawberry Point" or some other place? I guess it's our mind's way of connecting us to a place. Virginia is like that. In places, I was reminded of Iowa. When mom and I headed the wrong way out of Warrenton on Friday, we drove by some beautiful farms on a small two-lane road. It reminded me of the many roads in southwestern Wisconsin. But, we turned a corner and a Civil War plaque stood next to a stone wall. You don't see those in southwestern Wisconsin. We were reminded that this portion of the country has an American history that predates anything from Iowa. At times, that was jarring. But most of the time, it made me wish I could just drop everything and travel to places for a week at a time to experience the history of the place. There are so many corners of this country I have never been. 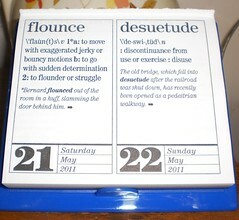 The words of the day for the weekend of the wedding. Lastly, no matter how warm the welcome, how soft the beds, how smooth the drive, how fun the event, waking up on Wednesday with a purring cat next to me defines happiness. It's good to travel but it's also good to be home.